Mice in Attic? How To Get Them Out! There's me, in these photos, a-trapping and removing rats and mice from attics. The trapping is just part of a total mouse control strategy. Well, not strategy really, that implies a long-term process. We get rid of mice permanently, forever, for the life of the building, in about a week. Guaranteed. How are you going to get those mice out of the attic? Poison them? Get a cat? Clean up your garbage? No, no no! That won't do the trick at all. To do it right, to do it permanently, you must find out how on earth those little rodent stinkers are getting in. Through roof vents, plumbing stacks, AC chases, ground level gaps, and all sorts of other places. They can squeeze through areas much smaller than an inch. Almost a half-inch, believe it or not. So you must find every single last spot that they can use to get in, and by golly, seal those spots shut with steel! Mice can chew through most anything, but not steel. So an experienced mouse control pro will find all of these areas, and seal them shut. Experience counts for a lot, because there's a lot of areas that mice can use to get in, and a seasoned eye knows them all, while a rookie does a lousy job and misses many tricky areas. Knowledge of mouse behavior, ability, and of building architecture counts for a lot. So get everything sealed up, and then don't poison, for crying out loud, unless you want stinky smelly mouse bodies all over the attic and walls. Trap and remove them from the attic. It's more effective, and less of an odor issue. Then clean the attic, and by golly, the job is compleat, no more mice in the attic. If you don't live in Orlando FL, click here for the National Directory of Mouse Trappers. Click here for my rat control photo galleries. I've written an article here about noises in the ceiling at night. Mouse Removal Methods - Main mouse page. How To Get Mice Out Of The Attic - It seems like mice find the attic to be a favorite place to live. It is warm, it is dark, and it provides with plenty of hiding spots for mice to feel safe. 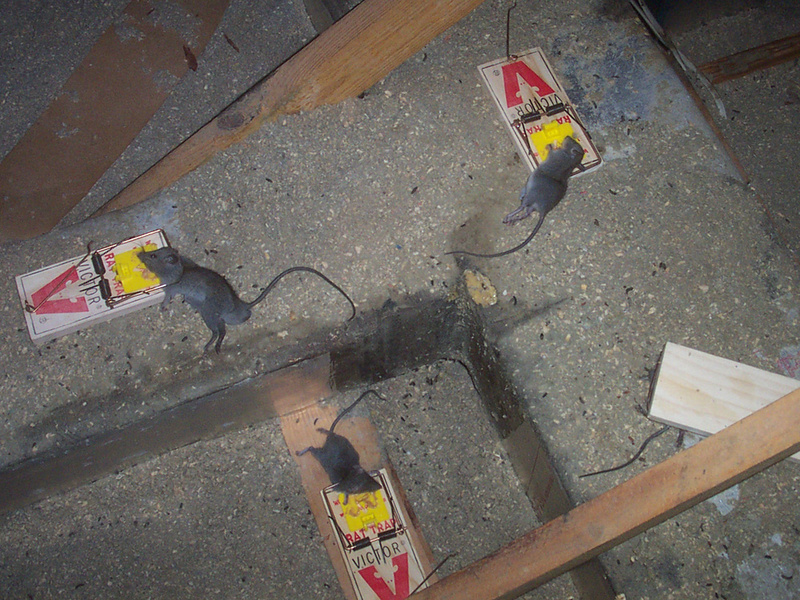 How to get mice out of your attic will depend on your personal family situation. If you have pets, even if they never go into the attic then you should never use anything toxic. There have been some owners that thought their pets never went into the attic just to find that they did on that one day. That is not a risk you want to take. After you've sealed up the entry holes, there are two ways to get the mice out of your attic. The first one is to use mouse traps. If they are live mouse traps then you can place them anywhere. However, live traps really aren't practical for mice. If they are the kill kind, preferably wooden Victor brand snap traps, then make sure that the trap will not go somewhere that you cannot reach to retrieve. Set the traps on mouse runways. The second way people attempt is to use repellents. There are some repellents available in home stores and some people make their own home repellent with cotton balls and peppermint oil. As I've said again and again, repellents don't work. Mothballs don't work, and keep in mind that they are toxic and they can make the attic smell bad. Nothing matters except sealing the holes shut, and once you've done so, just set the snap traps so that you remove the remaining mice inside the building. How To Find A Dead Mouse In The Attic - An attic is a very logical place for a mouse to make a home; the attic provides many things that the mouse finds necessary, especially warmth and shelter. Unfortunately it is the attic in your home, and unless you have a weird guest list the mouse came uninvited. Pretty soon the mouse became the houseguest that never left. Now after a couple of weeks you know that the mouse is dead because your entire house smells like a dead mouse. It is time to find it and get rid of the dead mouse; but the same things that made your attic such an attractive home for the mouse will make finding it now a bit more difficult. If you are asking how to find a dead mouse in the attic, then you will have to search for the place in the attic where the smell is the strongest. After you have determined the area you can begin by looking behind items like boxes or old things that you may have stored in there. If it is not hiding behind those places then it is time to look in boxes some holes in the wall where the mouse may have gone to die. You should follow the smell to get to the right place. 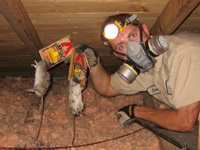 How To Clean Rodent Dropping In The Attic - If you have recently gotten rid of mice in your home and in your attic you should clean up the feces. If you leave the feces without cleaning some diseases can be spread to humans. Cleaning rodent droppings in some places in the home can be a bit difficult because you may not have as much space and because there is less light. You should however clean the feces as soon as you see them to prevent the spread of those diseases and the way to clean them may not be as challenging as you may think. You can use some sort of vacuum to pick up the feces as opposed to other ways that may not be as sanitary. Picking up the feces with the vacuum does not mean that you are done; it only means that you do not see the feces. You still have to disinfect the area in order to be done. To disinfect you can use bleach or a combination of two parts hydrogen peroxide to one part of water. The chance of you getting a disease from mice feces is rather small, but you should never take any chances especially if you have common household pets in your home. Now you know how to clean rodent dropping in the attic. How to get rid of mice in the attic: To be honest with you, getting rid of mice in your attic is not an easy thing to do at all. Because of how quickly these rodents breed and the fact that they are quite small makes them very difficult to get out of your home once they have found a place to set up residence. Your attic is a great location for mice and so trying to get rid of them can be quite a chore. Many look for a humane way to be able to do this but, to be frank, your alternatives are quite limited. Because of the fact that mice are so small you are hamstrung in what you can really do in terms of humanely getting the animals out of your attic. Such things as one-way funnels become very difficult to employ because they rarely work with mice. This leaves you with just a couple of good alternatives. If you want a humane approach to capturing them than the best option may be to use a trap. You can set out several traps that offer 4 to 10 different openings per trap that can be used to capture the mice and you can then set them free somewhere else or simply dispose of them in some other means. Using virtually any kind of bait excessively lure the mice into your trap where they will be captured. These traps are built so that mice cannot easily get out of them, resolving your problem and getting these critters out of your home. Another option, which can be seen as far less humane, is to poison these animals. Most do not really like this option, but the truth is that it is quite effective in solving your problem. As mentioned before, mice breed quite quickly. Trying to capture a whole large group of mice may not be a plausible idea when you get down to it. Because of the fact that you literally could have dozens if not hundreds of mice living in your attic, trying to capture them all so that you can dispose of them just may not be something that is plausible. You may find yourself spending hours every day clearing out these traps, only to find that new mice are popping up every day. While it may not seem like a very nice idea, using some kind of poison may be your real only alternative. You can either hire an exterminator to do the job for you, or there are several commercial brands that you can buy and deploy around your house to do the job. These will kill off the mice and leave you to just do the cleanup afterwards.